The goal of Local Marketing is to increase footfall to your physical locations – stores, restaurants, branches or franchises – and ultimately increase your revenue. Too many brands are just creating listings and calling it a day. That’s bad business. Ultimately it’s damaging to the customer experience, and the brand itself. 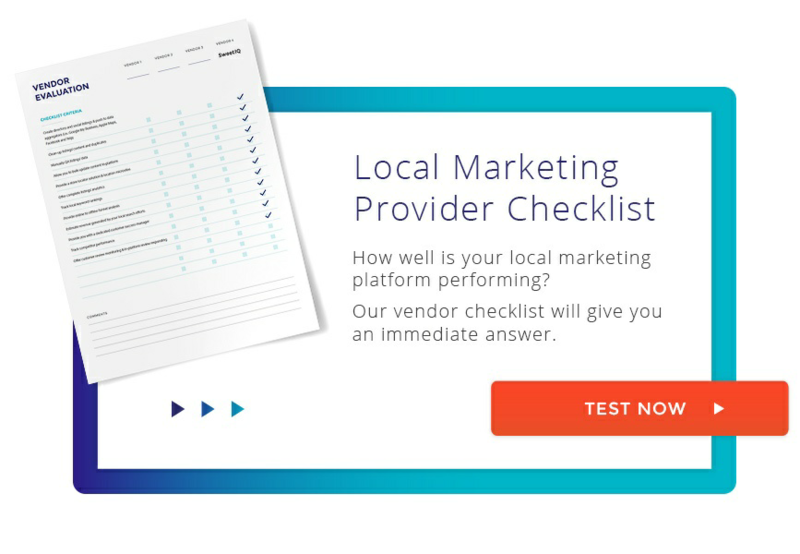 Multi-location brands need to consider different, and stricter, criteria for selecting local marketing software or platforms. Determining the right criteria, based on the actual needs and goals of your business, are critical to local success. Directories and social listings are not synonymous with Local Marketing, but they’re a key pillar. You need to make sure that the platform you choose will get your franchises and business locations listed on the directories that matter to your customers (i.e. : where your customers are searching and spending time). Beware of any platform that uses aggregators only. You should be looking for platforms that offer a mix of direct relationships with directories – particularly the most important ones – and aggregators. Getting listed on Google My Business, Apple Maps, Facebook is one thing. Make sure the information in those listings is clean and duplicates are removed. Crawlers, machine learning and algorithms are a must, but at some point supplementing that with work from a real human is necessary. No machine can determine “this info doesn’t make sense” like a person will. Missing or inaccurate information, as well as duplicate listings, creates a negative customer experience. Your provider needs to clean your current local ecosystem and look at it the same way your customers would. While you’re at it, you should be looking for quality customer support in the form of a dedicated customer success manager. They are invaluable to your results. They’ll help you understand what’s happening with your locations’ online presence and figure out the next steps. Local Marketing isn’t just listings. It’s an integrated ecosystem that includes all the sites your potential customers are looking for places to shop. Facebook is one of the biggest directories out there (and too often overlooked at the local level by national brands) with massive potential to bring customers to your physical locations. If you’re active on social networks, your local marketing platform should not only get you listed locally, store by store, but also allow you monitor and update your accounts. Even if your brand isn’t as active as it could be on social networks or review-based directories, your customers are. That means they’re rating your stores, leaving reviews, commenting and sharing thoughts on a wide range of sites like Google Maps, Yelp and Facebook. Responding and interacting with reviewers is a best practice for national brands that can also help win you new customers. Make sure the software you choose gives you both a strong review/reputation monitoring solution, including the ability to respond. On-site SEO is also a vital element of Local Marketing. Your local marketing platform needs to help you on that level as well. “Find a store near me” features add real value to your customer at a critical time in their shopping experience – when they are actively deciding where to shop. Not all store locators are created equally though, so dig into how the tools you are being offered function, how your customers will interact with them, and how search engines will treat them. Good store locators are vital to your brand. Marketing has always needed to demonstrate the ROI of their initiatives – Local Marketing shouldn’t be any different. So demand that the platforms you are considering offer a complete package of local analytics. You should be looking for metrics on listings, reviews, and keywords as your analytics baseline. The best platforms also offer online to offline funnel analysis – measuring local impressions and conversion clicks – that give you insights into how much revenue you are generating from your local search efforts. The best platforms will offer you every element listed above. The more you are able to measure your performance, the easier it is to prove to your CMO that you’ve made a great decision. Make sure you know how each of the features above impacts your local results. Good Local Marketing will drive more customers to your locations, generating more revenue for your brand.